Do you have recipes everywhere? I had bits and pieces of recipes everywhere, from friends, torn from magazines and they were a cluttered mess, I needed to get them straight. That is when I decided on my own recipe binder, this was a few years ago now and unfortunately, it is in need of a little overhaul and some much-needed tender loving care. The problem is the lack of organization; it is out of control, recipes are not in their right place, so it is time for a complete overhaul. Working out how to improve my system, I need to know what works and what doesn’t work; only with this information can I make the best choices when I want to change different aspects. The fact that the recipes are not put back in any particular order as there is no real system for keeping them in order. I want to create similar binders for my children with their favourite meals inside so they can cook the meals that they did as a child too. It is a way to pass on the family favourites so they don’t get lost. I have recently been looking for a recipe that my grandma used to make, it was a boiled fruit cake, it was like her signature fruit cake, unfortunately, no-one in the family seems to have a copy, so that is lost and it makes me sad. The first important area is an index, but the recipes need sorting into different categories. This means, by grouping them together and dividing them up there is more chance to find them. It also it will make the numbering system much easier and for the different sections to increase naturally in order that the system doesn’t fall apart by adding in new recipes that we like. The indexing falls into the categories too, this allows for new recipes, without failing the indexing system. Each pocket with the recipe in will have a number, this relates to where it needs filling, the section, denoted by a colour and each section will start from the number one, this will allow each section to grow as required. I keep spare poly pockets in the house in case I find a new recipe; this will allow me to add it to the system immediately and not having the start of the file becoming an unorganized mess again. I have been known to copy recipes out of recipe books because there just isn’t enough room to store all the recipe books in or near the kitchen; for one recipe out of a whole book it isn’t worth it either and this way I have my favourite recipes at hand. 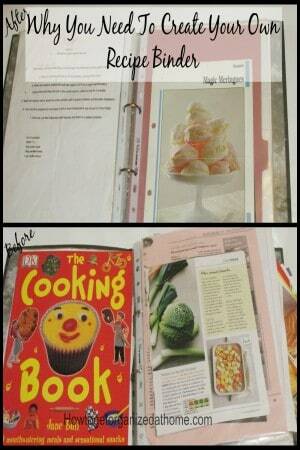 I now have my reorganized recipe binder and it is working so much better than I could have imagined. The indexing is working well, I just hope it continues to work well and help my recipes to stay safe. If you are looking for more articles on this topic head over to the landing page where you will links to other posts on organizing paperwork.